The flight touched down at Kuala Lumpur's Low Cost Carrier Terminal, or LCCT for short. No-one had mentioned that the timezone had changed so we thought the flight was an hour early, but in fact it was us who was out of kilter. It couldn't have arrived any sooner for Claire who, still suffering from a head cold had very bad pains in her ears as we descended. More swine flu declarations on entry and one more stamp in the passports. 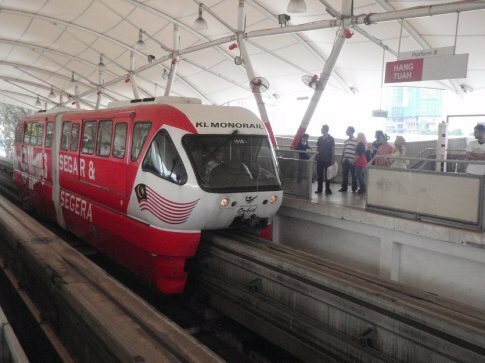 The guide book and the hotel we had booked suggested that the best way to get into town was via the train – but I think that must be for passengers arriving at KLIA, the main airport a few km away from LCCT. We would have had to take a bus to KLIA, a train (at 35 Malaysian Ringit, RM, about 6 to the pound) to the centre and then a taxi. There was a bus for 8RM straight into town so we took that and saved the hassle of all the transfers. It turned out to be a great decision as it left us off within view of the place we had booked, the Mayview Glory Hotel. Once we checked in it was time for action this was just a pitstop before heading up to the Perenthian Islands. My laptop was in a sorry state and there was an Asus service centre not too far from the hotel. We took an overpriced 15RM cab to Plaza Imbi (not knowing exactly how far away the place was). It was only about 2 km up the road, an easy walk but hindsight is always 20/20. I explained the issues to the very enthusiastic Asus repair guy and left it with him. He said there could only be three things wrong with it, there are only three components to the very basic machine – the keyboard/mousepad, the monitor and the motherboard. If it was the keyboard it would cost a negligible amount to replace but the motherboard would cost well over 100 pounds. Not too far away from the original cost of the laptop. We would have to wait and see. 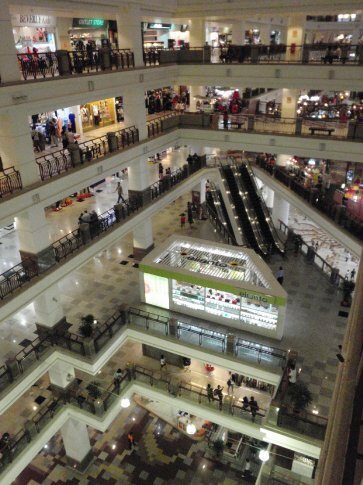 KL is great for shopping - computer / technology shops abound around Plaza Imbi. We had a quick look around and saw a great deal on a Dell netbook for about the same price as replacing the motherboard on the old Asus which had clearly seen better days. MMMM. A new laptop or fix an old one which broke in about 8 months. Same price. We would still have to wait and see. Following on from my new love of diving acquired on Koh Tao we would be heading up to some islands off the eastern Malaysian coast which are well known for diving and snorkeling. I had used a dive computer just twice but it had convinced me that it was not only safer but it would get me to dive safer and longer in the future. A bit of internet research into a dive computer I had tried looked at in Thailand put the cheapest vendor, rainbow Runners conveniently located 100m down the road in Plaza Berjaya. We went in an had a look and a play. It was a big investment but I was sure I would get the use out of it in years to come. I had to decide between a few different models. The older, more expensive, better looking Suunto Stinger or the newer, cheaper, cheaper looking D4 with better functionality. I would have to wait and see what happened with the PC. Claire had put up with all that exposure to computers remarkably well but we needed to do something more up her street. Across the road is one of the biggest multi-function shopping super centres I have ever seen: Plaza Berjaya Times Square. It is positively gargantuan. We were getting hungry so looked around the 12(!!) 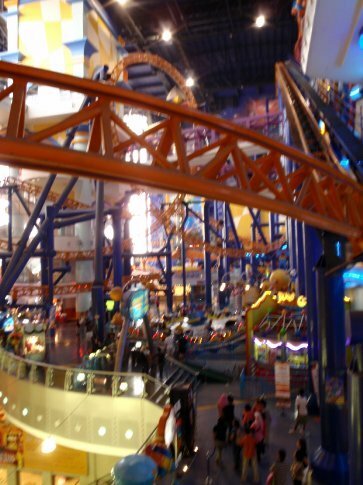 floors and on the 3rd or 4th, beside the cinema and curiosly underneath Malaysia's biggest indoor rollercoaster (!!!) we found a place promising the world's best chicken. 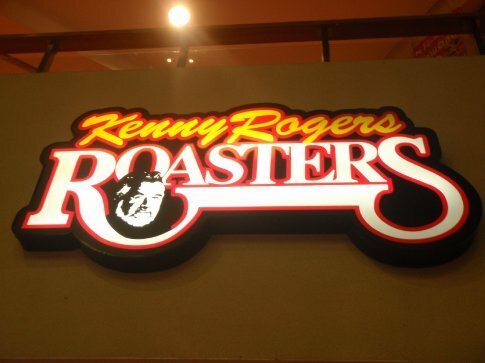 The last celebrity restaurant tie up I could ever have expected was with Kenny Rogers (!!!!). It was very American, in the insincere “have a nice day, sir” way but it was tasty and healthy and good value. They even give you a tasty muffin with your meal-deal. It was getting lateish by the time we finished up but we weren't quite ready to go home yet so we decided to grab a movie, seeing as it was on the same floor. There was a limited choice, however and the best of a bad lot was the latest installment of Transformers. We had seen the first one in difficult to hear Spanish with no subtitles on a bus somewhere in Latin America. So I was somewhat qualified to see the sequel but Claire wasn't. Being based on a kid's cartoon it wasn't a very complex plot and actually we agreed at the end much more enjoyable than either had expected. Claire had a lie-in the next day while I went down to the Indian Visa Bureau to get my visa sorted out. I had to provide photos and lots of random information including an address in India, which meant I had to go off and look on the internet for somewhere before going back and handing over some money. All this was for the clearance check alone which would take 5 working days. And if I passed clearance only then would I be able to hand over my passport for the visa itself. I preffered the chaos of Laos' visa on arrival or even the random bribery in Cambodia but this was the only way. By the time we checked out I had received an email from my friend in Asus saying that the only solution was to replace the motherboard. Perhaps it was time to buy a new laptop then. We did need to make our arrangements for later so we headed up to Putra bus terminal to get a ticket for Kuala Besut, the port of entry for the Perenthians. KL was turning out to be a very compact city, eminently manageable to get around using public transport or on foot. We didn't have time to see the sights but we knew we'd be back so were happy to get on with the chores at hand. Laptop was now one on the list. On picking it up, the Asus was unusable in its current state. The letter o had stopped working as well as the function keys so my blog was starting to l00k like a bl0g. Very bl00dy ann0ying if you see what I mean. We jumped on the efficient Monorail system to get back to Imbi. More because it was another mode of transport (number 40) than because it got us there any faster. Before committing in the place that had the deal I dragged Claire around about 10 shops to do a comparison of prices and models. It was a lot more structured than the complete impulse buy in Paraguay. I found one guy who would match the price and upgrade the RAM. Then we went back to the original place which was much bigger and for some reason I trusted more to see what they would do. They would throw in a mouse and upgrade the RAM. We left to let them stew for a while and go back to the dive shop. I tried my hardest bargaining but to no avail. They could go no lower on either the D4 or the Stinger. Finally I surprised myself by plumping for the cheaper D4. The few hundred ringit saved would make a very good contribution to the laptop. Back to the laptop place and he made his final offer by including a USB hub. It was a deal. They took a long time to upgrade the RAM and we were pushing it for time by the time they had finished. By the time we made it back to the hotel to pick up our bags and then go to the bus station there was only time for a rushed Pizza before the bus was due. Putra bus station doesn't have a system of platforms like any other we had been at. Rather there is a traffic jam of buses outside the station with a barrier preventing them from entering. We met a friendly guy called Alex in the station as we were munching our pizzas. He was heading to the Perenthians also and spotted a bus from our company in the traffic jam about 20 minutes before departure time. He went out, got on and we followed suit. It was comfortable enough night journey and the roads were far better but neither of us slept too much. I think I had too much new technology to play with.